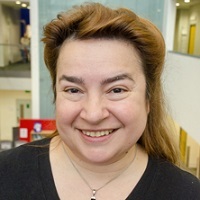 Xeni Dassiou is a Reader in Economics in the Department of Economics at City, University of London She is the director of the Centre for Competition and Regulatory Policy (CCRP) and the programme director of the MSc in Economic Regulation and Competition. More than 20 years’ experience teaching undergraduate and postgraduate courses, executive seminars and short time courses in microeconomics, industrial economics, mathematical economics, competition, regulation. Expert in communicating highly complex economic concepts and issues to all types of audience. She has excellent quantitative skills (a first degree in Statistics) and strong analytical skills in microeconomic theory and competition analysis. Specialised knowledge of the theoretical and applied economic foundations behind privatisation, competition and antitrust policy, market investigations and merger analysis, behavioural economics, competition and regulation in public service markets. Research on the impact of failed mergers on the returns of bidding and target companies in the UK, the role of herding in determining managerial and investment behaviour, the economic theory of bundling as an instrument of price discrimination both on a mathematical platform as well as on the economic policy related implications of bundling in government procurement and financial regulation. More recently research work has involved modelling the formation and updating of trust perceptions in infrastructure contracts, signaling theory and language formation, while policy related work has focused on public service markets economics, oversight and regulation. Dassiou, X. and Glycopantis, D. (2012). Optimal decisions in two-stage bundling. Recent Advances in the Analysis of Competition Policy and Regulation (pp. 95–115). Edward Elgar Publishing Ltd.. ISBN 978-1-78100-568-2. Dassiou, X. and Glycopantis, D. (2005). E-Commerce and the Role of Price Discrimination Using Transactions Bundling. ESSAYS IN HONOUR OF PROFESSOR STYLIANOS Α. SARANTIDES (pp. 843–870). Greece: University of Piraeus. Dassiou, X., Asteriou, D. and Glycopantis, D. FDI and Growth: Evidence from a Panel of European Transition Countries. Essays in honour of Professor Yannacopoulos (pp. 173–192). 2009: University of Piraeus. Dassiou, X. and Glycopantis, D. Notes on the Economics of Uncertainty. In Drandakis, , Glycopantis, and Stamatis, (Eds. ), Essays in Economic Theory, (In honour of Professor Theophanis Benos) (pp. 103–123). KRITIKI Publishing. Dassiou, X., Bilotkach, V., Mueller, J., Stern, J., Mirrlees-Black, J. and Rangoni, B. (2012). Regulatory-related discussions in three industries. 13th CCRP workshop 2012 20 January, City University London. Dassiou, X. and Glycopantis, D. (2011). Optimal Pure Bundling inder Gaussian Demand. INTERNATIONAL CONFERENCE ON COMPETITION AND REGULATION 1-3 July, RHODES, GREECE. Dassiou, X. (2011). Understanding the Behaviour of Regulated Individuals and Industries. 3rd Annual Regulatory Affairs International Symposium 30-31 March, Centre for Parliamentary Studies, Queen Elizabeth II Conference Centre, London. Dassiou, X. (2010). Using Behaviour Change to Deliver Regulatory Outcomes in a Time of Financial Constraint. Annual Local and National Regulators Annual Conference 2010, Civil Service World, Regulatory Policy Committee, BIS, LBRO, BRE and NAO 21 October. Dassiou, X. (2010). The Psychology of Regulation - Predicting the Behaviour of Regulated Individuals and Organisations. The Annual Regulatory Affairs International Symposium 2010 14-15 July, Centre for Parliamentary Studies, The Common Wealth Club, London. Dassiou, X. (2009). The Water Industry, Competition and Climate Change. CCRP Research Workshop 9-10 July, Aston University. Gboney, W.K., Cubbin, J. and Dassiou, X. (2009). Empirical assessment of the impact of power sector reforms in Africa: A study of the generation, transmission and distribution sectors. Dassiou, X. and Stern, J. (2008). Institutional Underpinnings of Trustworthiness in Infrastructure Contracts; Trust and Trust Perceptions. 7th Conference on Applied Infrastructure Research (INFRADAY) 10-11 October, Berlin University of Technology, Berlin. Dassiou, X. and Stern, J. (2008). Institutional Underpinnings of Trustworthiness in Infrastructure Contracts; Trust and Trust Perceptions. 2nd St Andrews Workshop in Applied Microeconomics on “Incomplete Contracts: Theory, Evidence and Applications” 9-10 September, School of Economics and Finance, Castlecliffe, University of St Andrews, Fife. Dassiou, X. and Stern, J. (2007). Institutional Underpinnings of Trustworthiness in Infrastructure Contracts; the Trust Case. International Conference “Public-Private Partnerships, Competition and Institutions” 7-8 December, Pantheon-Sorbonne, Paris, France. Dassiou, X. (2007). Gaussian Demand, Set Proportions Commodity Bundling and Dispersion Sensitive Behaviour. 8th SAET Conference 18-24 June, Kos, Greece. Dassiou, X. and Glycopantis, D. (2005). Price Discrimination through Transactions Bundling; the Case of Monopsony. Conference in the honour of Roko Aliprantis 17-18 October, Purdue University, West Lafayette, Indianapolis. Dassiou, X. and Glycopantis, D. (2017). A note on the envelope theorem. Economics Letters, 150, pp. 77–82. doi:10.1016/j.econlet.2016.11.006 . Dassiou, X., Langham, P., Nancarrow, C., Scharaschkin, A. and Ward, D. (2016). New development: Exploring public service markets. Public Money and Management, 36(2), pp. 149–152. doi:10.1080/09540962.2016.1118942 . Dassiou, X., Langham, P., Nancarrow, C., Scharaschkin, A. and Ward, D. (2015). Public service markets: their economics, institutional oversight and regulation. Palgrave Communications, 1. Dassiou, X. (2015). Greece in Economic Crisis: The Case of Health and Education. Vierteljahrshefte zur Wirtschaftsforschung, 84(3), pp. 145–164. doi:10.3790/vjh.84.3.145 . Dassiou, X., Langham, P., Nancarrow, C., Scharaschkin, A. and Ward, D. (2015). Public service markets: Their economics, institutional oversight and regulation. Palgrave Communications, 1. doi:10.1057/palcomms.2015.35 . Dassiou, X. (2015). Griechenland in der Wirtschaftskrise: der Gesundheits- und Bildungssektor. Vierteljahrshefte zur Wirtschaftsforschung, 84(4), pp. 59–79. Dassiou, X. and Glycopantis, D. (2014). A Tree Formulation for Signaling Games with Noise. Natural Science, 06(13), pp. 1128–1139. doi:10.4236/ns.2014.613101 . Dassiou, X. and Glycopantis, D. (2013). Welfare Analysis and Policy Implications of Bundling Decisions by Firms. Advances in Economics and Business, 1(1), pp. 6–21. doi:10.13189/aeb.2013.010102 . Dassiou, X. and Glycopantis, D. (2013). A Tree Formulation for Signaling Games. Game Theory, 2013, pp. 1–12. doi:10.1155/2013/754398 . Dassiou, X. and Stern, J. (2012). Competition and regulatory policy: 2012. Utilities Policy, 23, pp. 2–4. doi:10.1016/j.jup.2012.09.003 . Dassiou, X. and Stern, J. (2012). Competition and regulatory policy: 2012. Utilities Policy. Dassiou, X. and Glycopantis, D. (2012). Transactions Bundling in Monopsonistic Markets; Theory and Numerical Implications. , 9(1), pp. 105–131. Stern, J. and Dassiou, X. (2010). The water industry, competition and climate change. Papers from the Water Sessions of the CCRP Research Workshop, Aston University, July 2009. Utilities Policy, 18(3), pp. 113–115. doi:10.1016/j.jup.2010.08.001 . Dassiou, X. and Stern, J. (2009). Infrastructure contracts: Trust and institutional updating. Review of Industrial Organization, 35(1-2), pp. 171–216. doi:10.1007/s11151-009-9221-4 . Dassiou, X. (2009). Symposium on Modern Market Structure. THE JOURNAL OF ECONOMIC ASYMMETRIES, 6(2), pp. 1–5. Dassiou, X., Glycopantis, D. and Stavropoulou, C. (2009). Bundling in General Markets and in Health Care Systems. THE JOURNAL OF ECONOMIC ASYMMETRIES, 6(2), pp. 47–68. Dassiou, X. and Glycopantis, D. (2009). Symposium on The Structure of Modern Markets. , 6(2), pp. 1–5. Dassiou, X. and Glycopantis, D. (2008). Price discrimination through transactions bundling: The case of monopsony. Journal of Mathematical Economics, 44(7-8), pp. 672–681. doi:10.1016/j.jmateco.2006.11.003 . Dassiou, X. and Glycopantis, D. (2006). The economic theory of price discrimination via transactions bundling: An assessment of the policy implications. Review of Law and Economics, 2(2). doi:10.2202/1555-5879.1041 . Dassiou, X., Asteriou, D. and Glycopantis, D. (2005). “FDI and Growth: Evidence from a Panel of European Transition Countries”. Journal of Economics, Business, Statistics and Operations Research, 55(1), pp. 9–30. Dassiou, X., Choi, C.J. and Maldoom, D. (2004). Trade and Linked Exchange; Price Discrimination Through Transaction Bundling. The B.E. Journal of Theoretical Economics, 4(1), pp. 1–17. Dassiou, X., Choi, C.J. and Maldoom, D. (2004). Trade and linked exchange; Price discrimination through transaction bundling. Topics in Theoretical Economics, 4(1), pp. 39–55. doi:10.2202/1534-598X.1102 . Choi, C.J., Dassiou, X. and Gettings, S. (2000). Herding behaviour and the size of customer base as a commitment to quality. Economica, 67(267), pp. 375–398. doi:10.1111/1468-0335.00214 . Dassiou, X. (1999). The impact of signal dependence and own ability awareness on herding behaviour: a tale of two managers ... MANAGERIAL AND DECISION ECONOMICS, 20(7), pp. 379–395. Holl, P., Dassiou, X. and Kyriazis, D. (1997). Testing for Asymmetric Information Effects in Failed Mergers. International Journal of the Economics of Business, 4(2), pp. 155–172. Dassiou, X. and Holl, P. (1996). Merger failure and merger profitability: An alternative to the Hviid and Prendergast model. Applied Economics Letters, 3(4), pp. 271–273. doi:10.1080/758520878 . Dassiou, X. (1995). The Market Power Versus the Differential Efficiency Ambiguity; A Discrimination Theory. Journal of Economics, Business, Statistics and Operations Research, 45(3-4). Dassiou, X. (2019). INDEPENDENT REVIEW OF ESO REGULATORY AND INCENTIVES FRAMEWORK. OFGEM WEBSITE: OFGEM. Dassiou, X. (2016). Charter Review price setting models - a rail and road comparison study. BBC Trust webstite: BBC Trust. Andrikopoulos, A. and Dassiou, X. (2016). Market Structure and Exchange Rate Exposure: The Case of Consumable Goods. London, UK: City, University of London. Dassiou, X., Langham, P., Nancarrow, C., Scharaschkin, A. and Ward, D. (2014). Public Service Markets: Their Economics, Oversight and Regulation..
Andrikopoulos, A. and Dassiou, X. (2016). Show me your competitors and I will tell you if you are exposed : Market Structure and Foreign Exchange Exposure. Stern, J. and Dassiou, X. Infrastructure Underpinnings of Trustworthiness in Infrastructure Contracts: Trust and Trust Perceptions. Dassiou, X. and Stern, J. Infrastructure Underpinnings of Trustworthiness in Infrastructure Contracts: Trust and Trust Perceptions. Andrikopoulos, A. and Dassiou, X. (2018). Exchange-rate exposure in a “Rule of Three” Model. London, UK: Department of Economics, City, University of London. Dassiou, X. and Glycopantis, D. (2011). A tree formulation for signaling games. London, UK: City, University of London. Choi, C.J., Dassiou, X. and Maldoom, D. (2003). Trade and Linked Exchange; Price Discrimination Through Transaction Bundling. London, UK: City, University of London. Dassiou, X. and Stern, J. Infrastructure Contracts: Trust and Institutional Updating. Dassiou, X. and Gycopantis, D. The importance of reputation in the auditing of companies: A game theory analysis. City, University of London. Dassiou, X. and Stern, J. (2008). Institutional Underpinnings of Trustworthiness in Infrastructure Contracts; the Trust Case. Overview of competition policy in energy in the UK. Executive Summer School & Conference on Competition and Regulation (CRESSE), Greece, June 2006, June 2007, June 2008, June 2009. Introduction of competition in the UK energy market. Four 3-hour lectures for the module “Frontiers of Strategy and International Business” for the MSc in Shipping Trade and Finance. 3-hour executive seminar on the theoretical economic foundations of mergers and acquisitions. Co-Editor, Special Section, Utilities Policy, on “Competition and Regulatory Policy: 2012”, 2012 , vol. 23 (2-4). Chair & Organiser, Special Section: Recent Advances in the Analysis of Competition Policy and Regulation, June 2012, Joseph E. Harrington Jr. and Yannis Katsoulacos (eds.) Cheltenham, UK and Northampton MA, USA: Edward Elgar Publishing, Part IV: Financial Regulation, pp. 327-374. (Proceedings of Conference Special Policy Session on Financial Regulation CCRP/CRESSE, Sixth Annual Competition and Regulation European Summer School and Conference (CRESSE), Rhodes, Greece, 2nd July 2011). Co-Editor, Special Issue, Utilities Policy, on “The Water Industry, Competition and Climate Change”, vol. 18, Issue 3, September 2010. Co-editor, Special Section, Utilities Policy, on “Regulation and Competition Policy Issues: Papers from January 2009 CCRP Research Workshop”, City University London Research, vol. 18, Issue 2, Pages 63-112, June 2010. Co-editor, Special Issue, The Journal of Economic Asymmetries, Symposium on “Modern Market Structures”, Vol. 6, No.2, 2009..
Risks to Effective Competition in Markets. (2014). http://www.nao.org.uk/wp-content/uploads/2013/12/Roundtable-summary.pdf (pp. 6-9) National Audit Office Round Table Policy Seminar on Public Service Markets, Competition and Markets Authority (CMA), London April 2014. Training course on economic markets, asymmetric information and behavioural economics for the senior management of the FOS. Training courses on energy competition and regulation for energy markets regulators. 2-day intensive course in competition economics and game theory .